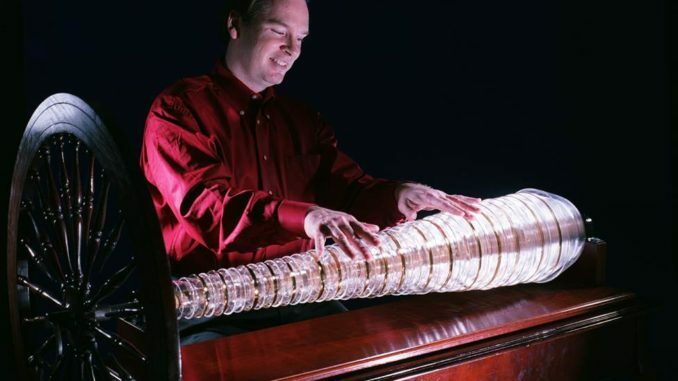 Join us on Thursday, October 19, 2017, from 5:00 p.m. to 7:00 p.m. in Green Hall Gallery as Dean Shostak will perform and give demonstrations of the Glass Armonica, an instrument invented by Benjamin Franklin, during the Cultural Arts Festival. Shostak began performing at age 14 in Colonial Williamsburg in the Music Teacher’s Shop. He earned a B.A. in Music from the University of Virginia and learned to play the pocket or kit violin and the hurdy-gurdy. In 1991 he became involved in the revival of the glass armonica. He has performed throughout the United States and his music has been featured in notable programs such as NPR‘s All Things Considered, BBC‘s Good Morning Television, and Mister Rogers’ Neighborhood. He has also written original scores for films for the National Park Service, City of Chattanooga, State of Tennessee, and the Norfolk Botanical Garden. Shostak currently lives in Williamsburg, Virginia with his wife Valerie, their two daughters, and one son.